When a book landed on my desk purporting to be the autobiography of Jack the Ripper, I had no choice but to pick it up immediately, and I'm glad I did. The book comprises a printed manuscript supposedly found among the possessions of one Sydney George Hulme Beaman (a well-known illustrator and the creator of Toy Town) and said to have been left to him as executor of the will for James Carnac. 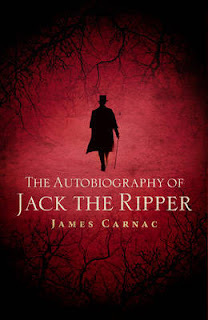 The manuscript opens with an explanatory note attributed to Hulme Beaman himself, followed by three sections of the life story of Carnac (who admits to being Jack the Ripper), an epilogue explaining the alleged death of Carnac, and some explanatory notes by writer and Ripper enthusiast Paul Begg. In part one James Carnac describes his early life, from his enthusiasm for seeing animals butchered, to the unfortunate events leading to the ultimate death of both of his parents (their throats were slit) shortly before his eighteenth birthday. Part two discusses his developing blood lust, and takes us through each of the Ripper murders with rather specific references to locations (not always accurate, as Begg reveals in his analysis). Part three finds the narrator under the suspicion of his landlady because this very manuscript is discovered. In Hulme Beaman's explanatory note and Paul Begg's analysis, they both refer to the cynical, unlikeable character of James Carnac. While Carnac is cynical, particularly when referring to the mythology that grew up around the Ripper, the story is told with an ever discernible humour. This is my primary reason for not entirely believing this is a legitimate confession: the whole story reads as though it is mocking the public's morbid fascination with Jack. This is not to say that it isn't a worthwhile read. It strikes me as satirical in the same way as Brett Easton Ellis' 'American Psycho', just swap consumerist America in the 1980s for blood thirsty London in the 1880s. Details such as the family tree of executioners and torturers, and his parent's timely demise, seem deliberately formulaic, and the author, whoever he is (they were) mocks those obsessed with finding reasons for the Ripper's killing. While I don't believe this is a legitimate account of the murderer's activities, it is a surprisingly modern take on the serial killer, and as a work of fiction produced during the early twentieth century, it should be considered groundbreaking in its very method of storytelling and characterization.